"An Unfinished Story" was originally just a test shot from an infrared modified camera on a new location I was scouting in March of 2014. The image has since become a popular item in my Sepia Collection. Look for a grand color or sepia panoramic from this location featuring the large thunderstorm complexes that frequently move out of Southern Colorado into the Texas Panhandle over the Summer months. Most of the locations I choose to photograph are scouted months or years in advance. Particular weather events provide the backdrop I am looking for. Wide open locations like this one where the camera is directed northeast provide an incredible foreground for a thunderstorm complex up to 200 miles away. The image here was captured utilizing a new prototype 100 inch tripod and panoramic head from Really Right Stuff. The height above the ground contributes to the view all the way to the horizon miles away. 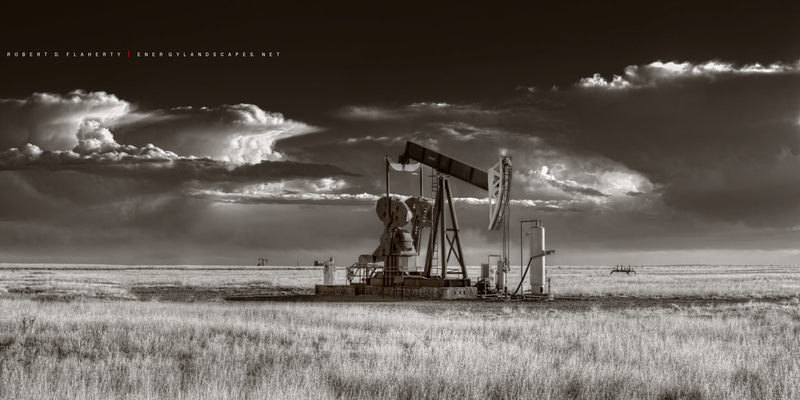 Oil & Gas Photography for fine art by Robert D. Flaherty. Photo © copyright by Robert D. Flaherty.